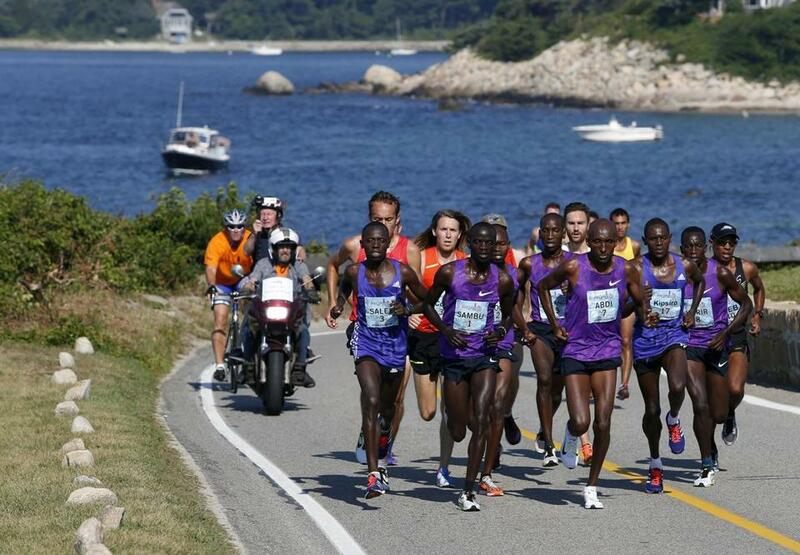 Stephen Sambu of Kenya shook off a headache to race to the finish line in first at the Falmouth Road Race. FALMOUTH — The heat and humidity gave Kenyan Stephen Sambu a headache. And that was before he stepped to the starting line of the New Balance Falmouth Road Race on Sunday morning. Another elite runner might have put aside title ambitions, but not Sambu. To push the pain from his mind, the defending champion focused on his race plan, going hard on the flat and downhill sections and saving energy on the uphills on the 7-mile course. Relying on his knowledge of the course, Sambu thought it would be wise to make a move around the 3-mile mark and gain some separation from the lead pack. He tried. But with the 80-degree temperatures, muggy air, and strength of the field, it proved too difficult. Sambu sensed the race would come down to a sprint finish. Turning onto Robbins Road, not far from the 6-mile mark, he opened up a very slight advantage as the lead pack dwindled to five runners. It was a late-race show of strength that foreshadowed what was to come. With the win and the countdown bonus still in the balance, Sambu charged downhill to the beachside finish with one last surge. 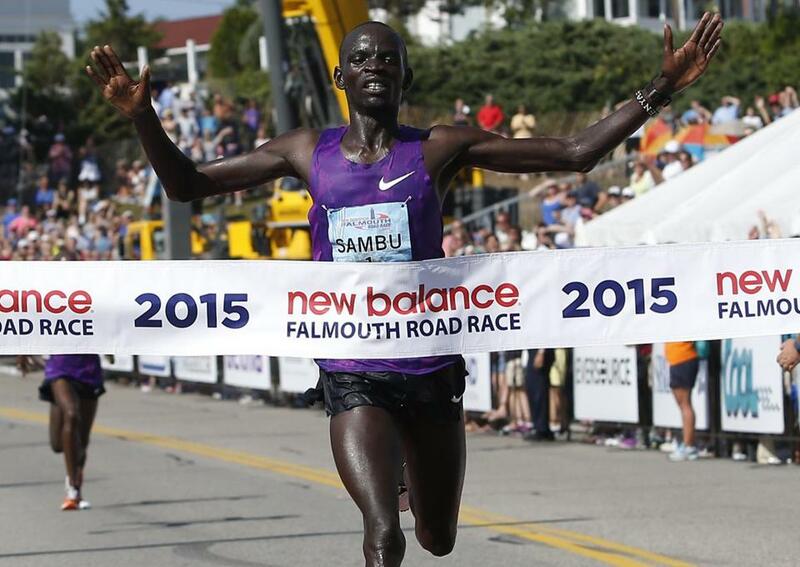 Sambu crossed the line first in 32 minutes 17 seconds and defended his 2014 title. His countrymen Micah Kogo (32:19) and Leonard Korir (32:20) followed in quick succession. 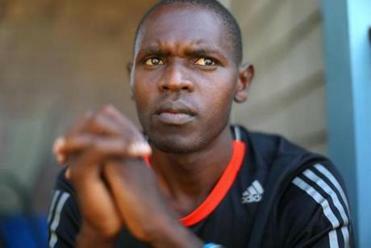 Kipsiro, running in Sunday’s Falmouth Road Race, exposed a Ugandan coach who allegedly raped female runners, according to authorities. Wearing a bright pink race uniform, Diane Nukuri was hard to miss as she took the lead from the start and never faltered. After being outkicked for first place at the Beach to Beacon 10K on Aug. 1, Nukuri didn’t want a repeat performance at Falmouth. Understandably, the two-time Olympian from Burundi looked particularly determined as she reeled off early miles of 5:12, 5:13, and 5:11. Nukuri ran a 5:08 for Mile 4, opening a nearly 10-second gap on American Sara Hall and Ethiopian Sentayehu Ejigu. Even though Nukuri struggled slightly and looked less smooth as the course headed into the neighborhood near Falmouth Harbor, she still managed to increase her lead. Nukuri finished strong in 36:47. Hall (37:10) came in second and Ejigu (37:26) third. Men’s elite runners neared the 1-mile mark. With times rounded up, Sambu also captured the inaugural countdown challenge by three seconds, earning a $5,000 bonus in addition to his $8,000 first-place prize. This year, “The Countdown” was introduced to create a competition between the men’s and women’s elite field. Based on the calculations that took into account the gap between the men’s and women’s winners in past years, “The Countdown” clock at the finish line ticked down from 4:28 as soon as Nukuri crossed the line. The men’s winner had to beat the countdown clock to win the bonus. If the clock had expired before Sambu crossed the line, then Nukuri would have taken home the bonus. “The Countdown” brought added excitement to the finish and appeared to factor into how aggressively the elite fields raced. Nukuri joked that she hoped Sambu would spend some of his countdown bonus on her and treat her to ice cream. 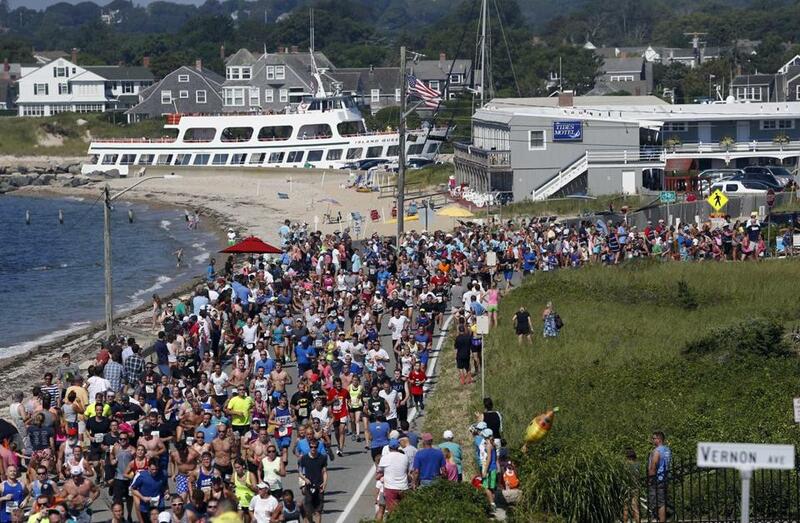 Runners made their way alongside the ocean during Sunday’s Falmouth Road Race. In the men’s race, Sam Chelanga finished fourth overall and earned top American honors. Chelanga was sworn in as a US citizen on Friday in Tucson, where he lives. His wife, Marybeth, grew up in nearby Plymouth, where the couple married in 2011. Chelanga said he will spend a couple of days with family in the area, then it’s back to work. While 2014 Boston Marathon champion Meb Keflezighi missed out on a top-three finish for American men, he did take home first place in the men’s masters division by nearly six minutes. And given some recent issues with his right hamstring that forced unplanned time off from training, he used the race as a tempo run. Keflezighi is focused on a yet-to-be announced fall marathon and the US Olympic trials. The one competitor who seemed unfazed by the heat and humidity was women’s wheelchair winner Tatyana McFadden. She finished in a course-record time of 26:27, beating the mark she set last year by 39 seconds. Equally impressive, the woman who has dominated distance wheelchair racing in recent years was just 35 seconds behind the men’s third-place finisher. And McFadden knew if she could keep her speed consistent, she had a shot at the course record despite the heat and humidity that made it tough on the other elite racers and the more than 10,000 runners who reached the finish behind them.